Neely followed me on Twitter... I followed her back. 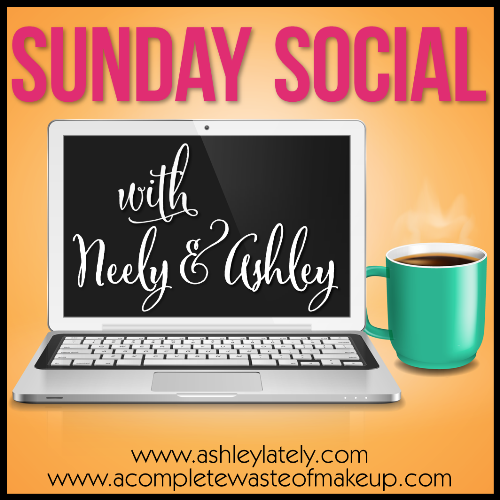 I clicked over to her blog (a complete waste of makeup) and suddenly found myself sucked into the Sunday Social with Neely & Ashley. I loved the simplicity of the questions. I clicked every single link on the list to see what everyone answered... so I decided I would join in! 1. What are your favorite things to do on a lazy day? 2. What is your TV guilty pleasure? 3. What is your favorite road trip music? 4. What are your favorite magazines or books to read by the pool or laying around? I don't read any magazines any more. I am constantly reading books though. My favorites would probably be paranormal... sci-fi... and anything young adult. I read to escape into a world. I don't really want it to be a serious and deep world. My kindle always has something new... and I'm a member on netgalley since I write book reviews. (They provide "digital review copies to professional readers". I'm totally going to put "professional reader" on my linked in.) I finish one book and immediately move onto the next. I have to say my favorite thing to read are completely trilogies (or series). I love finishing book 1 and being able to immediately move onto book 2. I'm a horrible waiter when it comes to reading. 5. What is your favorite snack? Does coffee count as a snack? If I can pick coffee I'm going with coffee. Otherwise, I guess I'll say ice cream. (Is that a snack?) I can eat ice cream any time of day. I can eat ice cream in any season. The ground is covered with multiple feet of snow and I'm now thinking we could run to McCool's for a scoop... or a milkshake. Check back next Sunday. I love reading these types of posts... so I'm thinking the Sunday Social would be a fun thing to join each week. Let me know if you might join in too! 1. Favorite breakfast food 2. Best way to spend a free day 3. Airline ticket to anywhere in the world….where would you go and why? 4. You can only leave the house with one thing…what is it? 5. How do you take your coffee?